"Pat's emphasis on safety helped make us comfortable with the challenging climbs. He was friendly, professional, and always willing to share information and personal experiences that heightened our enjoyment of the weekend..
We will certainly pass along rave reviews and recommendations to our friends and family who might want to visit Joshua Tree in the future"
My son and I had a great day learning the basics with Don Reid. It seems like the whole team at Joshua Tree Rock Climbing has the same high level of professionalism along with terrific climbing resumes. Two weeks later I'm still thinking about that magical day in the desert with a gifted instructor who is both a wise and gentle soul. Jerry F.
Mark Bowling combines the qualities of a born teacher, the great expertise of an extraordinary rock climber with a gentle , kind and persuasive personality. In just a few lessons he taught our four year old son JJ the fundamentals of rock climbing, gave him the security he needed ( and which we as his parents were looking for). But more important than all the technical skills he learned from Mark, more important than any rocks in Joshua Tree National Park he climbed with his teacher ( and there were quite a few), was the maturing process which Mark helped develop during the few lessons he gave JJ. We could see our son grow mentally from lesson to lesson, we could see him gain self confidence, in other words he grew above his age in maturity and security during the few weeks we were fortunate enough to be able to let Mark influence the growing process of a perfectly normal 4 year old. So I have been using Yelp for a while, but this is my first review. Maybe that is an indication of how much fun I had today. My gf and I hired Mark as our private climbing guide for the day. He put together a day of great climbing and lead climbing training. It was perfect. Challenging and fun and we learned a ton. I will definitely go back and ask for his help again. Jeremy S.
Don Reid is the man. I took my girlfriend out there for the Basic Rock Climbing 1 school. We showed up at 8am and Don was already there and completely set up. We started out slow with 3 other rookie climbers but by the end of the day we were tackling 80 ft. climbs. Don is smart, patient, kind, funny, and seriously awesome. For someone who has never really done outdoor climbing I can say that with Don as the instructor I was filled with enormous confidence with every climb we did. I would highly recommend Joshua Tree Rock Climbing school for anyone interested in learning how or anyone who just enjoys being out in the desert doing awesome things with great people. I can't wait to go back. 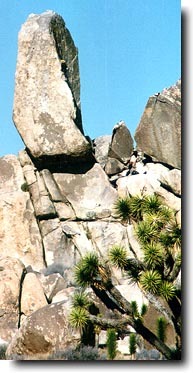 Clint B.
I had the most amazing experience through the Joshua Tree Climbing School. If it weren't for my friend Lea, who introduced me to indoor climbing, I probably would have never tried to enhance my skills through an Intermediate class up in J.T. This would be my second time climbing outdoors, my first time in Joshua Tree, and one of the best things that I've ever done. Steve was our instructor and he was a no B.S. kind of dude. He was extremely knowledgeable and trustworthy, and pushed our group to go above and beyond their capabilities--not to instill fear but more to show us that we're so much more capable of what we think we can do. Day 1 started with Steve teaching us several knots that we would need to know to create slings, extend ropes, and tie in and set anchors. Then he showed us all of the anchor devices and techniques. Once we were schooled on the tools we needed to set anchors, he set us free to set up some anchors around the boulders around us. He always checked our work and critiqued what we did right, wrong and how we could have improved it. After about a half day of anchor lectures and practice settings, he set up some top ropes for us to climb for the rest of the afternoon. I'm a 5.9 climber in the gym, and he set up some 5.7 cracks that I found really difficult and challenging, but a lot of fun. On Day 2 we drove to another part of the park. This was the real test. Not only did we have to scramble up the side of a mountain with gear, but we also had to partner up and set up anchors, and then repel off of them. Again, he always checked our work and safety was always a priority. I never felt jeopardized, but always challenged. Once we repelled off of our first anchor sets, he let us top rope off of them. The second part of Day 2 got even more interesting when he led us back to the top of our first anchors, showed us how to tear them down, and then led us to even higher ground "free soloing" it up the mountain (i.e., scrambling without rope) to set up another set of anchors. I have to admit that I was scurrred, but I put all of my faith and trust in Steve and my group. Steve would remind us that if there was something we felt uncomfortable with to let him know so he could rope us in or spot us from behind. Our group was cohesive--we looked out for each other, checked each other for safety and never left anyone behind. It was pretty gnarly (the best descriptive word for this) to sitting at the top of a mountain, setting up anchors, looking over the edge for accuracy and then having complete faith in your work by repelling off of it and then top roping it over and over. I really had no idea what I was in for when Lea invited me to go with her on this weekend excursion, but it was worth every penny. Not only did I improve my climbing skills, but I also walked away with some pretty cool mountaineering survivor skills, a new set of friends, and last but not least, bruised and scraped knees and knuckles. In short, Steve RAWKS!!!! Liza S.
I would highly recommend this outfit for rock climbing esp if you have Steve. Not only did I find him amazing but I also have seen his name pop up on other sites that review this sort of thing. I did a one-day class and agree whole-heartedly with Liza. I didn't know what to expect and he blew away any expectation or preconceived thoughts I might have had. More importantly, I left class thinking that I could go rock climbing on my own with lots of confidence. That is really what I was after- getting the basics so I could go on my own. I am not too interested in Day 2 as it is quite unlikely I will be anchoring but it's good to know in the event I ever had to do it. Again, I did not attend Day 2. If you're looking for a one-day class, I recommend this company and esp if you could get Steve. Christopher B. Our guide Mark Bowling, was amazing. He asked us specifically what techniques and skills we knew and which ones we wanted to learn to be competent lead climbers during our short stay at Joshua Tree State Park. Mark was precise, and was able to our questions even before we asked them. I hate it when people use the term "veritable fountain of information," but he was the epitome of the saying. Not only was Mark a great instructor but he also was a great person who made the whole experience fun and interesting. I trusted with my life (literally) completely and wish I could have his instruction the entire week I was there. I know there are at least 2 other other guiding/instruction companies but I will never try them. I am completely happy with the money I spent and I highly recommend Joshua Tree Climbing School. Justin R.
I came to Joshua tree this past weekend camping with several friends. A girlfriend of mine and I decided to try our hand at outdoor rock climbing. We both had very limited experience, with only a few trips to indoor rock climbing gyms. I wasn't sure what to expect but I was extremely pleased. We booked our class really late - but the school was able to accommodate us without hesitation. We were lucky enough to have Steve as our guide who was a wonderful guide and an awesome instructor. He really pushed us, there were times when we wanted to give up and Steve was so encouraging and comforting that we didn't give up, and made it to the top of the rope each time! Steve was so helpful, knowledgeable and kind - and I trusted him full heartedly. We had wonderful time, and I hope to come back for day two very soon! Christina N.
I was part of a group of 4 that signed up last minute in a busy season for the beginner 1 rock climbing class/ experience. First of all let me say how much I appreciate JTCS accommodating us last minute. Thank you so much Mark! I'll preface this review by saying that the four members of our group had either very little climbing experience, or were complete novices. We arrived at the meeting spot at 8am (easy to find as long as you follow the instructions on the website) and met Mark and Steve. After about 15 minutes of introductions and gear fitting, we began the class. Steve was our instructor. He was very professional and friendly as well as humble. He was patient and explained the concepts and instructions very well. Whenever we had a question or concern he made sure that he explained and that we understood before moving on. Something that i really appreciate in an instructor. Most of the morning was spent learning the basic systems and commands for belaying a top-roped climber. This was really basic stuff and for beginners such as ourselves it was very valuable. Steve also covered basic concepts about moving across and up the rock face. I learned some new stuff about smear technique as well as how to navigate a route and look for the "path of least resistance". As I have mainly a gym climbing back ground up to this point, both concepts were very useful. The afternoon was spent climbing and practicing belays. Steve was again, an excellent instructor. He was attentive to the climber and belayer and provided useful instructing as the climber struggled to ascend the route. Interestingly, one thing I noticed was that Steve was not a cheerleader. He seemed to provide only pertinent information to the climber and then let the climber work through the problem. All in all I have no negatives to note regarding our experience this weekend with Steve and the Joshua Tree Climbing School. If you're a beginner climber and looking to learn more, these guys are top notch and I would highly recommend them. Steve was our guide, and I can't imagine having a better experience out there than we did. The weather was pretty nasty in the morning and he made adjustments about what we were going to do so we'd be most comfortable. He gave us all the same basic info to begin with, but quickly tailored his advice to each individual based on what each of us needed. We only had four people (I understand they top off the class we took at 6, which is awesome) so we had a lot of personalized attention. When up on the rock, he made "suggestions" about where to go when we seemed stuck, but let us figure it out on our own when it was clear that was what we wanted to do. I think it was careful listening and attention (and a lifetime of experience) that offered him the insight to make the right comment to each of us when we needed it. He made a joke about wanting to learn from the old guy who's done it all and is still alive, and I have to say, it did make a difference knowing that he had been through many years of scenarios and ways of doing things in order to be able to offer us the best of it all. The only "irk" I had was at one point when I was up on the rock, there was unrelated conversation happening below that made me wonder if they (in particular my belayer) were paying attention to me, but every time I looked down, all eyes were on me so I may be nitpicking. I took the four day rock climbing course here and could not be happier with the instruction received from my two teachers. Scott and Steve have both been climbing for over 30 years. Both teachers are unique and have a lot of knowledge to bring to the table, as well as different methods of teaching. Scott was really good with teaching the basic fundamentals with footwork, teaching safety, and helping develop climbing confidence. Steve was very good with teaching anchor systems and also a very good instructor. I was very fortunate to have these two as my teachers; out of the school they are two of the two I really wanted to climb with. Scott is a very good teacher and motivator and Steve is also great at what he does. Steve has climbed El Capitan in Yosemite over 100 times, that shows you how good he is. I have also heard good things about Mark and Don if you have them as instructors. I met Don and he was really cool and seemed very knowledgeable. As for Iana's review, a lot of the instructors are independent contractors for Joshua Tree Rock Climbing School and it is insulting to give them one star because your a drama queen and had a bad conversation with the owner. You even admitted Don was a great instructor, so grow up and adjust your review; you are insulting the instructors who actually do the majority of the teaching. Also a note, do not get this school mixed up with Joshua Tree Rock Climbing Guides, they steal 50% of Joshua Tree Rock Climbing School's business and you are not getting instructors with 30 years experience. Brian H.
My husband and two six year old girls had an AMAZING experience with Mark Bowling in February. None of us had climbed before, and he was a great teacher and had us all confident enough to make our way up the mountain. He was organized and knew exactly how to run the time. What was most phenomenal was how patient and kind he was with my kids; he spoke respectfully to them and made them want to do their very best. They were so focused and keen on climbing and did so well because of the way he spoke with them and guided them. That half day climb was truly the highlight of our week in CA. Emillie M.
I almost never write reviews but I was moved to write this one after spending two days with Scott Cole from the Joshua Tree Rock Climbing School. My friend and I flew out from Tennessee for a two-day course. This was to be the "intermediate level" class, but it was tailored perfectly to our different needs. After calling several other area services I was a little worried but after I interviewed Mark Bowling on the phone, I felt pretty good that we'd have a good time and learn a lot. The website was easy to use and we received prompt confirmations of our reservations. Scott is such a fantastic, fascinating guy and what a wonderful instructor! His credibility is built from a lifetime of experience and that made such a difference to us. I've been climbing for about 23 years, with an 8 year hiatus, and sometimes receiving instruction from young guys who might have a certificate or have been climbing hard for 5-6 years is a little difficult for me. They often cannot explain why something is done, just that "that's how it is" or "I learned that in a class last year". This is why I was pretty excited when I interviewed the business owner (Mark) on the phone, and he said the instructors were typically over 50. Since resuming climbing, I've sought out instruction from a variety of people and though some younger folks are good climbers, their instruction does not resonate with me in the same way as learning from Scott. In addition to having credibility, he is incredibly technically sound and had excellent reasons behind all of his "preaching" (his term). Scott was also a ton of fun to be around, professional and punctual. We truly enjoyed meeting and climbing with him, and will be employing much of what we learned very soon. The rock was superb too. I hope to come back another time. Durt G.
Gotta agree with the other reviewers here who gave Steve Gerberding glowing reviews. He had the skills, made sure everyone got personal instruction, and most importantly made the class fun. He was full of passion for the sport of rock climbing and had a sincere interest in teaching others. Steve is such an easygoing and humble guy you would never guess his climbing resume includes multiple first ascents up El Capitan and spires in Patagonia. I now feel confident enough to join friends on climbs and climb safely. Kazuaki J. Great experience! We (two inexperienced but athletic girls in our early 30s) did the two day basic class and were guided by Don and Steve. The guides were extremely helpful, provided great tips and very patient. They are older and have extensive and impressive climbing experiences (steve had over 100 ascents of El Capitan and Don has written guide books). I took one other very short class with another rock climbing group in Joshua Tree that was guided by a talented but young guy that wasn't a great teacher. JTRCS in my opinion provided a 100 percent better experience. I felt safe the whole time and they really took the time to prepare us and make sure we were secure and safe. We had a family in our group with little kids and also more experienced climbers. They adjusted the group class to fit everyone's needs. I'll be back to take the intermediate class once I get a few more climbs under my belt. I highly recommend climbing with Don and Steve. Mrs R.
My family and I had a great experience with Mark at Joshua Tree Rock Climbing School. He was very good with our 8 and 10 year olds. Showing us the ropes with a very calm and confident demeanor.